Who needs a golf cart? Not this guy, who’s riding the love child of a motorized golf vehicle, an electric scooter, a Segway and…uhm…a warehouse handcart. Yep, that’s the Mantys, a single-passenger golf cart that you can ride standing. Despite the older gentleman riding one, it’s not meant just for old people. 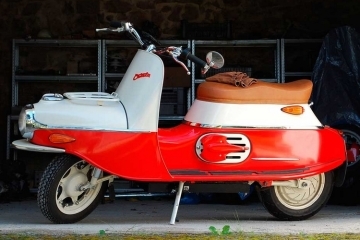 I think its a perfect ride for lazy folks like myself also. 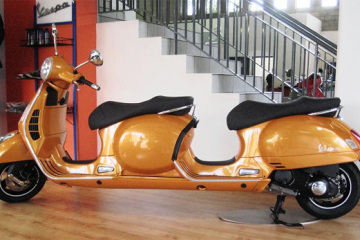 I’d probably use it as an electric scooter everywhere also. And if you are suddenly switching from video games to something more outdoorsy like golf, it sure will take some time to build up your stamina. 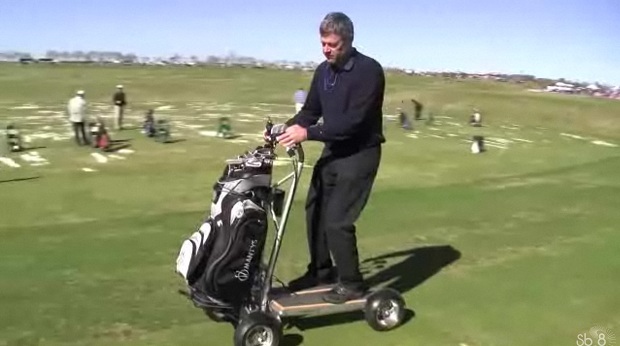 So if you get tired on the golf course, just ride the darn thing straight home like a Segway. Ultimate win. Mantys is a foldable motorized cart on four turf-saver wheels, sporting 51 x 28 x 55 inch dimensions in riding form. There are no seats – just a dual ski-like platform for you to stand on. 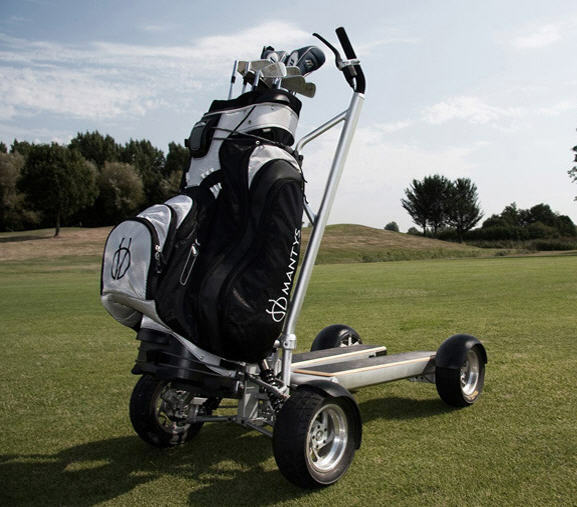 When not in use, the golf course mobility machine can compact into a tight 16-inch bundle. 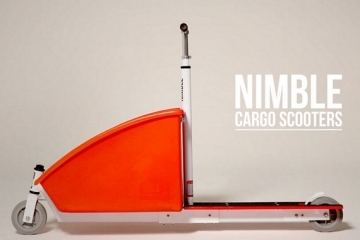 Since it also weighs a relatively light 45 lbs, it should allow for very convenient handling and storage. 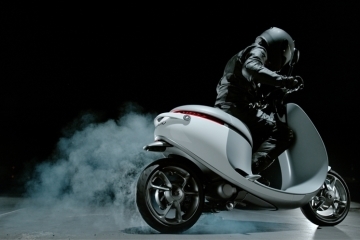 It runs on two 500-watt electric motors, managing a top speed of 12.5 mph. Sun Mountain claims it can go a generous 36 holes on two 24-volt Lithium-ion batteries without a recharge. 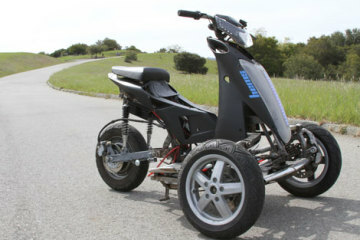 Optimized for use in golf courses, it can climb slopes of up to 20-degrees. Since it’s smaller than a regular golf cart, it allows for a more direct route to the ball, potentially speeding up play. Each Mantys vehicle comes with a universal mount (for your golf bag), a scorecard holder, designated areas for your ball and tee, and a cup holder. We’re not sure if motorized golf carts are really up for an update, though. We’ll know soon enough when Mantys launches sometime this year for at around $3,250. Can I buy a Mantys in England? How much to they cost, and will they be available in England? 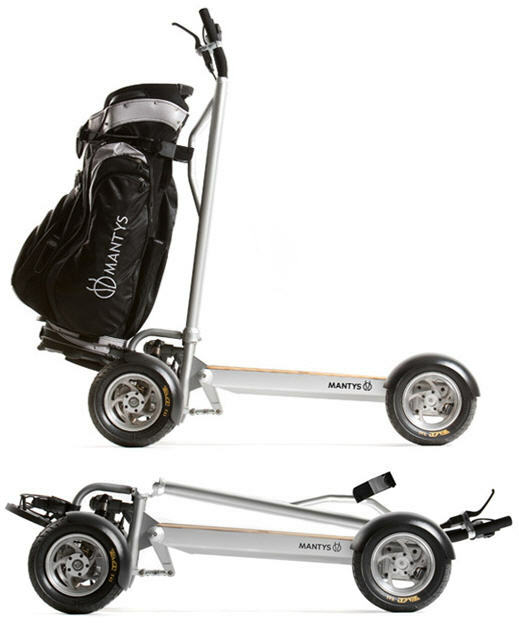 I would like to purchase a mantys foldable golf cart. I live in Hammond Park, Western Australia & would be grateful if you could email the nearest supplier please. Also costs please. Interested in New Zealand agency and selling in quantity , Costs and specifications please.